Maverick Vinales took the Moto3 World Championship with a thrilling race-winning move at the last corner of the season in Valencia. Vinales, 18, was one of three Spanish riders separated by just five points going into the race but won to take the title by 12 points from Alex Rins. Luiis Salom led the standings going into the race but crashed out, leaving Vinales and Rins to battle it out. 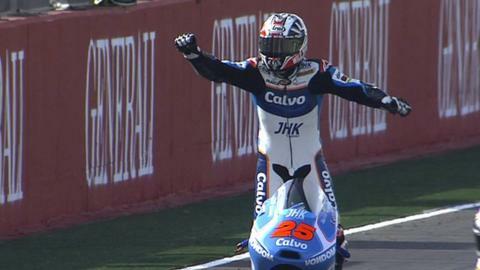 And Vinales sealed the title when he held off a move from Rins to win. Salom, 22, came into the race with a two-point advantage over Vinales but crashed out for the second race in a row, losing the front end to slide out into the gravel. He was able to rejoin and finish 14th but had blown his chances of taking the title in a season where he won seven races. Rins, 17, took the lead with three laps left and he and Vinales swapped the lead multiple times for the remainder of the race. Vinales led going into the last corner, and when Rins charged through he ran wide, allowing Vinales to move back up the inside for the win - only his third of the season. Rins was pipped on the line for second by German Jonas Folger, but sportingly applauded Vinales's victory as he crossed the line. In Moto2, Pol Espargaro had already clinched the title heading into the final race, which he was leading until he crashed. Local favourite Nicolas Terol won the race, followed by Jordi Torres and Johann Zarco.